by Girish Dubey, President of Star. Inc.
Sealcoating professionals frequently ask as how to change the mix design to suit the weather related conditions, sand/aggregate loadings or simply in the amount of water in the mix. Before we attempt to answer such questions, it is imperative to understand the fundamentals relating to sealer drying, film formation, mechanism and the factors which influence the proper set and final cure of sealer films. Lets us start with the basics; sealer composition, film formation, the conditions for proper film formation and finally the adjustment of mix designs. Majority of sealcoatings are intimate dispersions of refined coal tar (or asphalt cement- AC), clay, emulsifiers and specialty chemicals in water. Being water-based, sealcoatings are safe to handle and store. 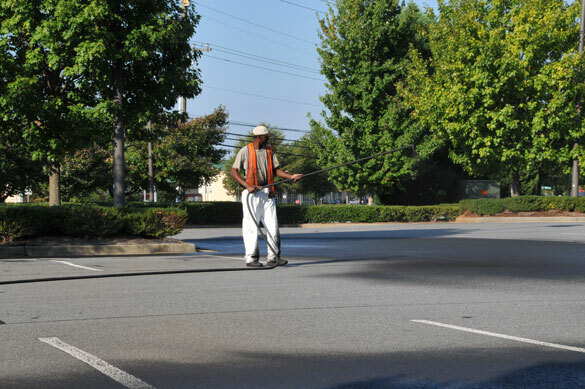 Over the decades it has been established that sealcoatings provide years of protection to asphalt surfaces, when applied properly and allowed to cure under the right ambient conditions. 1 - Refined Coal tar or Asphalt is called the Binder or the glue that holds the inorganic fillers (clay, sand/aggregate, etc.) tightly bound in the sealer film, after full cure. Both asphalt and coal tar are thermoplastic materials meaning that they soften and melt at higher temperatures and become hard at cooler temperatures. Binder is the backbone of sealcoatings. 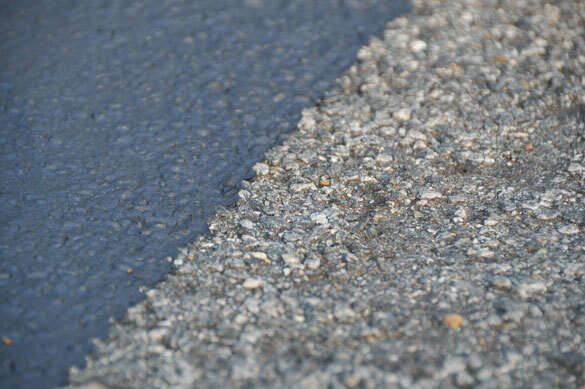 It is the component that protects the asphalt in the pavement. In the wet state (uncured), sealer contains a fine dispersion of binder particles in the range of 2 to 5 microns (human hair is approx. 25 microns or 1 mil), either in spherical or elongated cigar shapes. Upon full cure the binder forms a continuous film, enveloping the filler particles (1-2 microns) thus holding them tightly in the cured film. Micron is millionth of a meter and Mil is one thousands of an inch. 1 - Clay, fillers and aggregates impart proper toughness and dimensional stability to the sealcoating film and counteract the tackiness of the binder at elevated surface temperatures. 2- Specialty chemicals, such as surfactants and emulsifiers keep the binder and filler particles properly suspended and dispersed in the wet state, providing a stable system. 3- Water is the fluid medium, in which the above components are dispersed. Water is the major component. In most concentrated sealcoatings, water constitutes about 60% by volume. Sealcoatings are commonly supplied in a concentrated form, which have to be mixed with water, sand/aggregate, and additives (optional), prior to application. 1 - Water (a) gives fluidity to the sealer, (b) satisfies the water demand of sand. All fillers absorb water which is called their water demand which has to be satisfied by water in the mix. Fillers also absorb the binder which is called the binder demand. (c) Water also wet out the pavement for proper flow, leveling and adhesion of the sealer to he pavement. 2 - Sand /Aggregate (a) impart slip resistance and traction (b) uniform textured, non-streaky appearance with reduced sun glare (c) improves wear ability and (d) hides minor surface defects. 3 - Additives are added to enhance the performance or speed up drying or sand suspension or all of the above. There are many additives that are recommended to perform specific function in sealer mix designs. Mix designs are simply the guideline for the proportions in which these components are to be mixed, according to the usage requirements of the pavement. For example, low traffic may require, low water of dilution, low sand loading, one coat application. Conversely, medium traffic may require more water, more sand, the use of an additive, and multiple coat application. 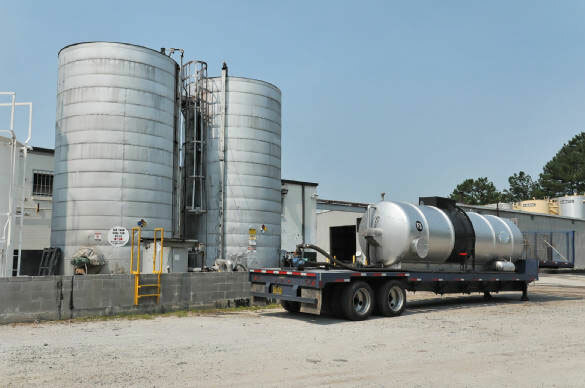 Mix designs are also adjusted to accommodate weather conditions and or varying amounts of fillers, additives, etc. Water is the major component of sealcoatings. The sealer supplied as a concentrate, typically contains 60% water, by volume. After adding 30% water to 100 gallons of the concentrated sealer, the water proportion increases to nearly 70%, by volume. Sealcoatings, being water-based, attain full cure through the loss of all the water from the wet film. As the water leaves, the volume of the wet film shrinks, in proportion to the amount of water (by volume) in the mix. For example, if the mix design has 70% water by volume, the wet film will shrink by 70%, i.e. down to 30% of the original volume. As the water evaporates, it creates a steady turbulence in the sealer film, which forces the suspended particles (binder, filler) into a closer proximity. The film becomes progressively denser, thus forcing the binder particles to touch each other and fuse into a continuous film, encapsulating the filler particles, in the process. Simultaneously, the binder bonds to the pavement. Properly cured sealcoatings form a continuous film, free of voids or imperfections, which stop water, chemicals, salts, etc. from penetrating and damaging the asphalt pavement underneath. Understandably, any deficiency in the curing process will not allow the binder to fuse properly and leave voids in the film, thus resulting in inferior performance or failure. The wet sealcoating film is not one solid entity, but think of it as being a composite of several layers of very thin films (imagine a sheet of plywood). Like most water-based coatings, sealcoating dries, in successive layers, from top to bottom. As each layer dries, it shrinks in volume, becomes tight and relatively impervious to water vapor, therefore, impeding the evaporation of water from the bottom layers. The first 80% to 85% of the film dries relatively fast, but the release of the last 10% to 15% of water becomes difficult and requires the right set of ambient and pavement conditions. It’s a fact that the release of water from the bottom layers of most water-based coatings becomes progressively difficult as the film cures. For optimum performance, all water must leave the film: 80% to 90% is not good enough. The uncured 10% to 15% of the coating will be torn or dislodged if traffic is allowed on it too soon. The percentages mentioned here are only to explain the phenomenon. They will, of course, vary with material and mix designs, e.g. mix designs with fillers and/or aggregates will dry faster than sealcoatings coatings without them. Pavement and ambient temperature, Relative Humidity (R.H) and wind velocity have a very profound effect on the rate of water release from wet sealer film and the final cure. Temperature, both ambient and pavement, influences both aspects in the proper film formation and final cure; release of water and fusion of binder particles. Cold Temperatures: The minimum recommended application temperature for a sealer is 50°F, and rising. The fusion of the binder particles to form a continuous film is greatly enhanced at higher temperatures. Conversely it is significantly reduced at temperatures below 50°F. 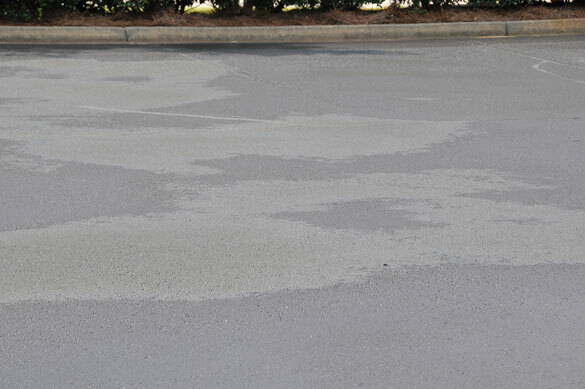 When sealcoating is applied below 50°F, tar (or asphalt) particles do not soften and form a continuous film, thus leaving clay and filler particles uncoated. The color of the sealer, cured under such conditions, usually turns out grey and blotchy in appearance and never returns to its normal slate black appearance even at higher pavement temperatures, at a later date, because the temperature of the pavement normally does not reach high enough to re-melt the binder particles and force them to flow and form a continuous film. Even if the pavement temperature reached high enough, still it will not assure proper fusion. The binder particles will melt but will not have the capability to flow and envelope the clay and filler particles already set in a rigid matrix. Needless to say sealcoating cured under cold weather conditions lacks the film integrity and the expected performance properties. 1 - Consider using an additive (1-2% on sealer volume) that will help the sealer dry faster. Such additives contain fast evaporating solvents which combine with water in the sealer, accelerating the evaporation rate, at low temperatures. Most rubberizing (performance boosting) type additives also speed up the water evaporation. Such additives form a polymer network within the sealer film, which forces the water out of the film at a uniform rate. 2 - Reduce water of dilution as much as possible, use the lower limit. Hot Temperatures: Sealcoating applications under hot temperatures can be equally problematic. Sealcoatings should not be applied under the summer sun ( over 90°F ambient) without first cooling the surface. If applied to a hot pavement, the sealcoating film almost gets “baked” as soon as it hits the pavement, resulting in a film full of pinholes. The sudden loss of water immobilizes binder particles in the sealer and prevents them from fusing into each other and forming a continuous film. Devoid of proper fusion process, binder particles do not effectively envelop the clay and filler particles in the sealer film. As a result, binder stays as discrete particles, not hardened by clay and filler particles. The sealer film, under such cure condition, may not reach the hardness and continue to stay sticky and soft. And that could lead to lead to a “tracking” problem, where the sealer may be tracked into the buildings onto the carpet or tiles. 1 - Cool the pavement with a find mist of water (“fogging”). Avoid puddling, otherwise sealer may just slide right off during application. 2 - Not as effective as fogging but acceptable and generally used approach is to add more water in the mix (3-5%), to increase fluidity. Relative humidity (R.H.) or humidity is another major factor that greatly influences the film formation and final cure of the sealer. R.H. is the ratio of the actual moisture content of the air, at a specified temperature, to its total capacity. For example, 50% R.H. means that only half of the air’s total capacity is used and it is capable of absorbing another 50% of moisture or vapor from surroundings. Conversely, at 90% R.H., it has very little capacity left (only 10%) to absorb additional moisture, thus drastically slowing down the release of water (cure) from the sealcoating film. The sealer film will release only the amount of water that can be accommodated by the atmosphere. The atmosphere and the surrounding environment can be thought of as a sheet of paper towel: when dry it will soak up the spill but will not if the towel is too wet. At 100%R.H., the sealer film may take if not days, several hours to cure. The slow cure is further aggravated by low temperatures, e.g. the rate of water evaporation is nearly halved for a 10 degree Celsius drop in temperature, at a given R.H.
1 - Reduce water in the mix design, use only as much as needed for a good workable consistency. 2 - Allow longer drying time in between coats; do not apply the next coat even if the previous coat “looks” firm. Wind velocity or air movement, especially under highly humid conditions, helps sealer dry faster than without any air movement. 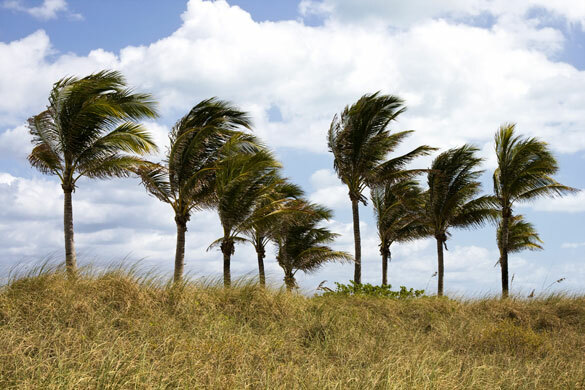 A light breeze assists in the dissipation of water and volatiles from the immediate vicinity. On the other hand sealer may dry too fast for properly handling windrows, under breezy conditions at low humidity ( 20-25%). Mix Design Alteration Suggestion. May consider adding a bit more water if the sealer is drying too fast for proper flow and leveling of the wet sealer. 1 - Water- Within the mix design range recommended by the sealer manufacturer, use only as much water as is needed for proper flow and workability. Excessive water reduces the cured film thickness and may result in pre-mature wear. 2 - Sand/Aggregate. The amount of sand/aggregate may be adjusted according to the pavement usage. The sand/aggregate loading shall not exceed 4-5 lbs. per gallon of the concentrated sealer because; being filler, sand will absorb binder as well as water. It is a desired property. By absorbing binder, the sand becomes an integral part of the coating. The limit is about 5 lbs., because above 5 lbs. sand absorbs too much binder to be available for adhesion to the pavement. The coating becomes too rigid to flex with the pavement. Also it may show adhesion problems. Another important consideration is the mesh size of the sand/aggregate. It must be within 50-60 mesh size range, because finer the sand, higher the number of particles per lb., higher will be the total surface area and higher binder absorption. Sand with 100 mesh size has 8 times the number of particles and twice the surface area than 50 mesh sand. The binder and water absorption is directly related to the surface area. Additives: Use where they add a definite value or solve a situation. Out of the myriad of additives, it will be prudent to ask your supplier about the specific role of the recommended additive and how will it benefit the overall performance. Ignore suggestions to use vinegar or Elmer’s glue, or magnesium chloride, etc. as additives. They may damage your sealer. When in doubt, discuss with your materials supplier. Use the mix design guideline as suggested by your manufacturer and contact them for special situations, where the mix designs are not workable; material preparation, application, pavement or weather conditions. Work out the details which suit your set of conditions.